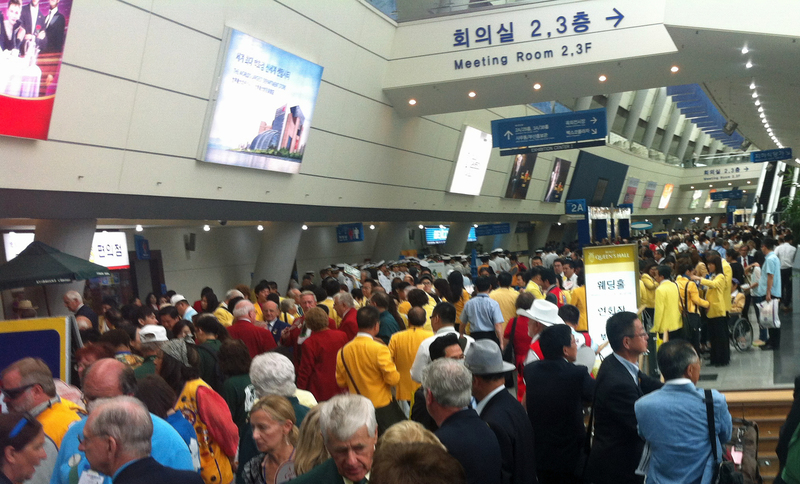 This week I am joining an estimated 55,000 Lions in the Republic of Korea, for the 95th Annual International Convention of Lions. If you’ve never been to an international Convention, stay tuned for a few words, and hopefully lots of pictures that might inspire you to attend. 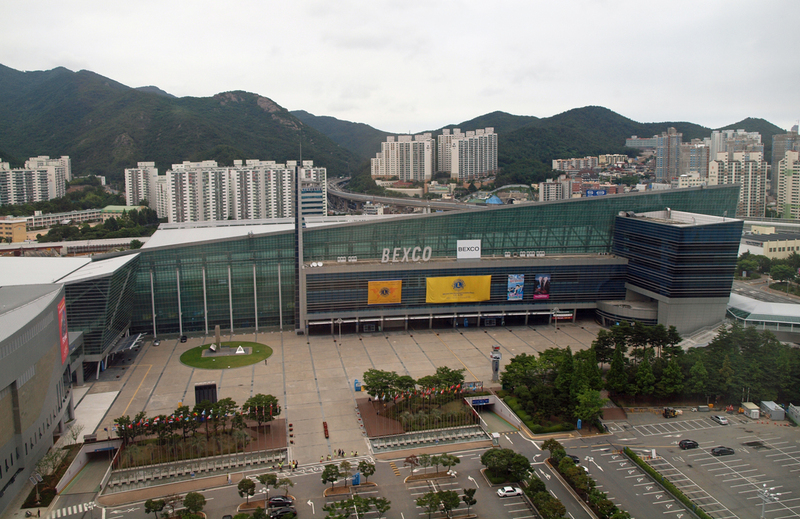 Busan is in the South of the Republic of Korea, and many of us have found interesting ways to travel – mostly via Seoul, but often passing through Honk Kong, China, or even Indonesia- depending on the air carrier of choice. Incheon Aiport in Seoul is clean, bright and looks like it could handle about 1000% more passengers than I saw there this morning. Customs was a breeze – even despite the 1.5m cylinder I had strapped to my back. This was nothing more than our banners and flags for the Parade of Nations, but I did expect some comment. A speedy, clean and safe train from the airport landed me in Seoul. I’m writing this first short post, from my seat on the KTX (bullet train) from Seoul to Busan. At around $50 for the ticket, it’s cheaper than a connecting flight and hopefully a lot more interesting for those of us who have never travelled on a ‘very fast train’. It will get up to 300kph, and be in Busan in less than 2 and a half hours. National Conventions, spirits are high and the mood positive. Looks like I am the only one tweeting on LCI’s official hashtag #lionsclubs2012. 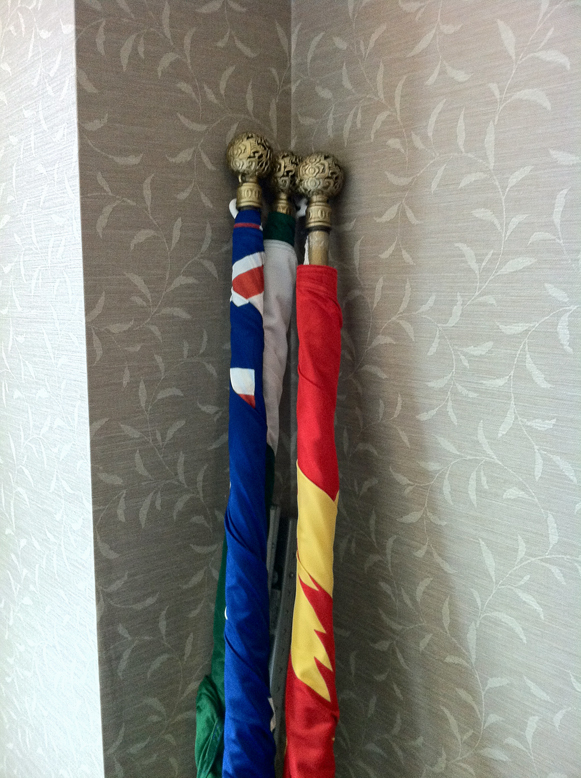 Tomorrow will be catching up with our delegation, shopping for flagpoles and registering for various events. Photo’s soon! For a short while, as an Economics student at Sydney University, I lived in an attic room adjacent to the Uni. I could literally watch my colleagues, from my bedroom, arrive for our first lecture. My room at the Australian delegation hotel is a little like that. My photo of the venue shows our emblem proudly on display. With great hospitality at Busan Railway station, the emblem on display, and special offers for Lions being advertised in our hotel rooms; the local Lions have obviously been working hard to make this a success. Day 2 is always about procurement. It’s generally more cost effective to purchase a few items overseas rather than ship or carry them, and in the past, shipping has been a little unreliable. The day started with a meeting with Council Chairperson-elect Lou Onley, covering a range of matters related to his soon-to-start year as Chairperson. No rest for the wicked. The next step was to source the all-important flagpoles for our events and the parade. Accompanied by Lou, we quickly made our way to the South Korean equivalent of Bunnings! Being the shy, retiring type, the language barrier often finds me walking miles around shopping centres looking for our items. Not so for the incoming CC; with a lot of smiling, excellent mime skills [*diary note – first choice partner for charades), and lots of pointing, we found ourselves in possession of some excellent, fancy-topped curtain rods…er, flagpoles. The rest of the day saw registration, the important visit to the parade office, hunting for cellotape, cable ties and other paraphernalia, and sourcing good coffee – which accompanies catching up with Lions who have been arriving all day. CC-elect Lou reports our DG elects are aquitting themselves professionally as expected, bringing credit to our Lions. 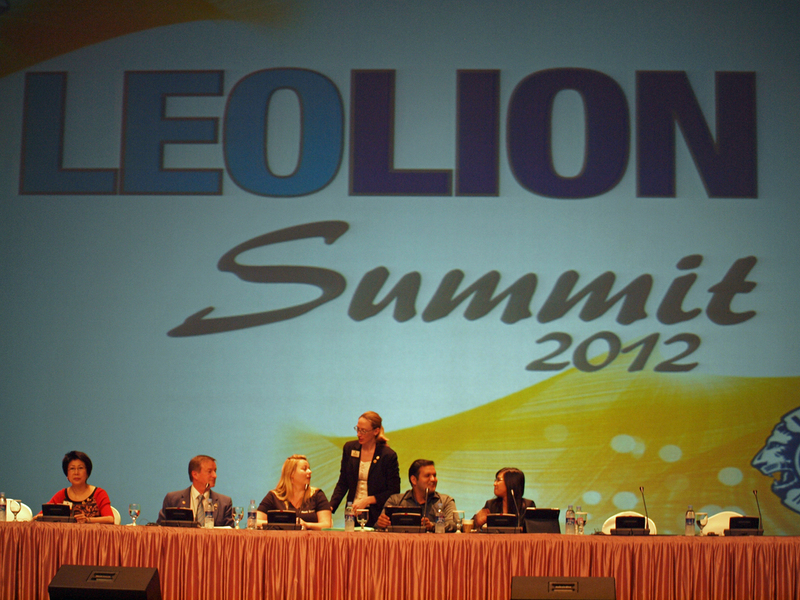 Tomorrow will be a highlight, as I attend the Leo Seminar at the Headquarters Hotel. Stay tuned! There is no better way to see a new city than on foot, so my day starts with a very early stroll out to Haendae Beach where our Governors-elect are staying, and return. This beachside town has its own appeal, although not in the Australian way, with lots of activity including fishing, swimming and many walkers even this early in the morning. Everywhere in this part of Busan, and much of Korea, you are ringed by the green mountains that surround the townships. The bus trip to the Busan Lotte Hotel for the Leo Lion Summit is slow and the few passengers express considerable admiration for the Korean bus drivers who navigate these behemoths through crowded and chaotic streets. I chat to Bradd from Niagra Falls, Canada and a few New Zealand Lions who are attending the summit. The highight for me was hearing from our own Leo Lion Tom Porter who gave the keynote address over lunch. Tom aquitted himself with an engaging, relevant and well presented address about his experience as a Leo who joined as a Lion, and his reasons for doing so. Congratulations Tom; you brought credit to our Multiple District. MD201 has a great story to tell about Leos. 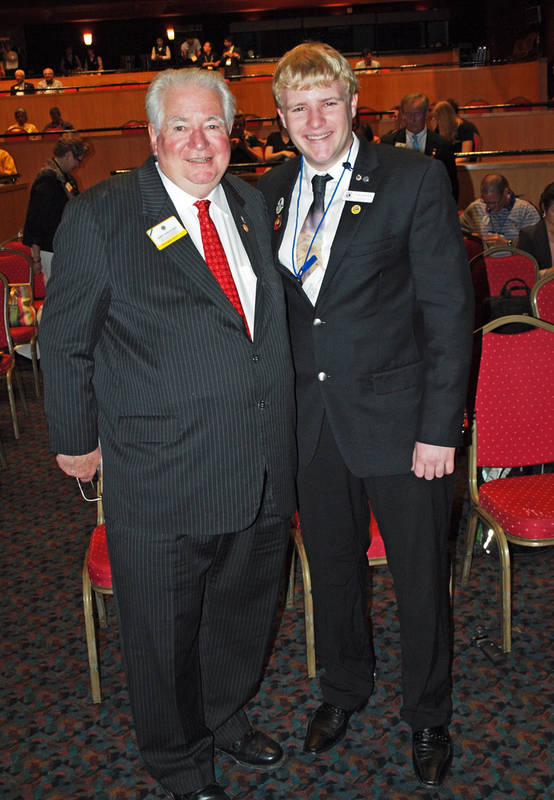 Many Lions and Leos, past and present, have invested energy, creativity and time in building clubs around our country. Leos aren’t just the Lions of tomorrow, they deliver great community service today, and it was wonderful to see them recognised at the Summit in Busan. Tomorrow; the Downunder Breakfast and Parade of Nations. 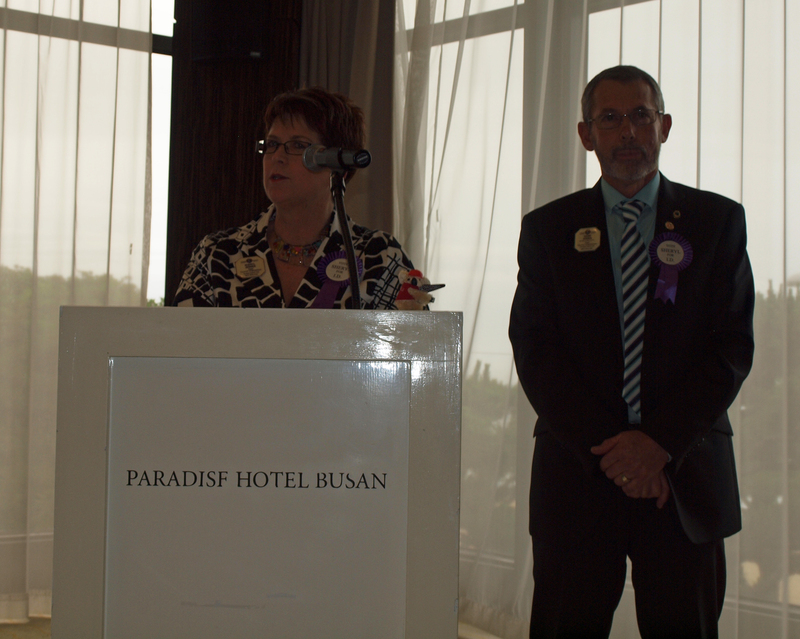 A big day for the Lions in Busan! Each year, the Lions of MD202 and MD201 take turns in organising the ‘Downunder Breakfast’, a chance for our Constitutional Area to come together for breakfast during the Convention, and an opportunity for candidates for International positions to introduce themselves to the delegates. Congratulations to MD202 who hosted a great breakfast this year. We were fortunate enough to have the Ist Vice President Wayne A Madden, 2nd Vice President Barry Palmer and Immediate Past President Sid Scruggs in attendance, as well as our International Director Eddy Widjanarko, and many Past International Directors from our Constitutional Area. The breakfast included an address from Past Council Chairperson Sheryl Jensen, who is standing for the position of International Director for our Constitutional Area this year. You can find out more about Sheryl here. Loaded up with breakfast, it was time we all made our way to the start of the International Parade of Nations; the colourful celebration of our multi-national service organisation. This year more than 20,000 Lions would be marching in a parade lasting over 4 hours. 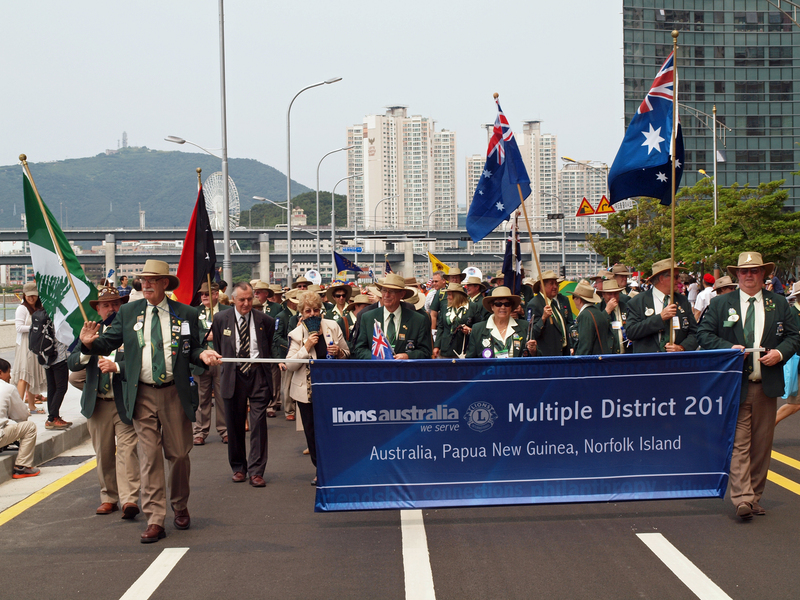 The picturesque walk along the Busan foreshore saw many locals coming out to cheer the Lions who have invaded their city. The smiling faces, friendly ‘high fives’ and genuine warmth of the locals made the 2km walk all worthwhile. Tonight will be the International Show and various receptions, including that hosted by our friends in MD202. The official Convention program has 3 plenary sessions. The first plenary is the official opening, and focusses on an address from the current International President, giving his official report on the last 12 months program. 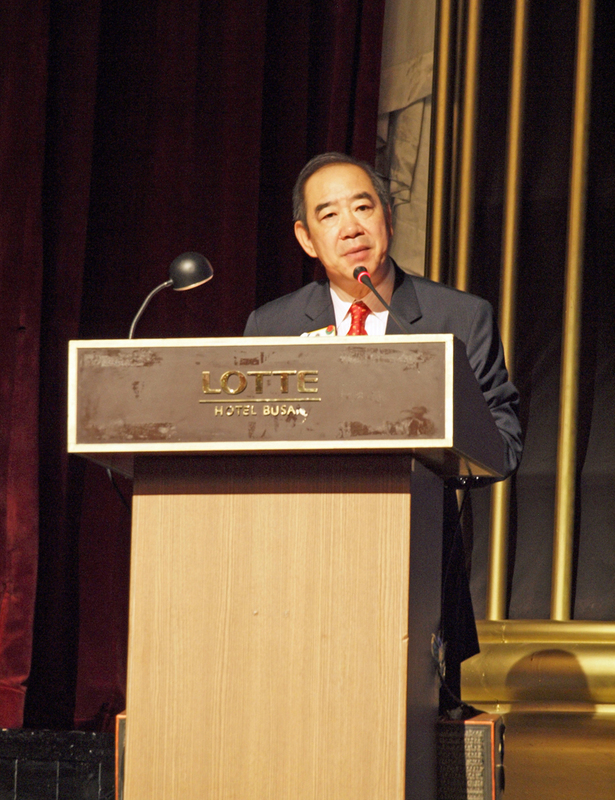 President Tam’s program built on the program of previous presidents, with strong examples of visible community service. The strategy of the organisation is to provide visible and contemporary examples of community service that will both solve community issues and problems, and inspire others to join. President Tam’s focus has included a strong direction to involve young people in the organisation, and I reported earlier on the first Leo Summit. The best known of his programs, however, is the plan to plant trees around the world, to inpire the community, tackle climate change and create a universally appealling initiative for clubs. The initial target for the Association was set by President Tam at 1 million trees. 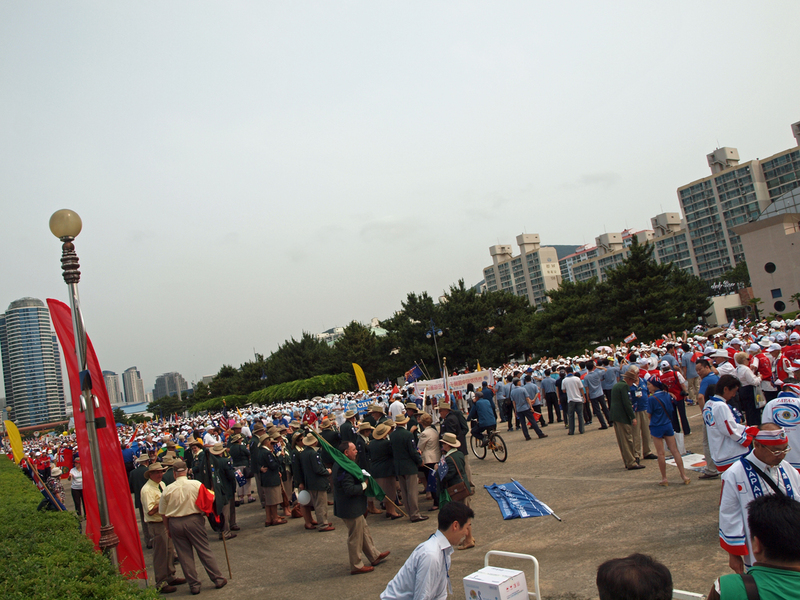 The District Governor worldwide team, quickly increased that target to more than 4 million plantings. The final result didn’t disappoint, with an announcement of 12.8 million trees planted (and this was quickly revised to more than 13 million with the latest pledges) This is a great result for Lions. See the video of this announcement here! The second plenary is always interesting and today was no exception. There are three focii for the plenary; acknowledging community service, reporting from our Lions Clubs International Foundation, and hearing from the candidates for the International Board. There is usually a keynote address, with notable alumni including General Colin Powell, Condaleeza Rice, and former US President Jimmy Carter to name a few. 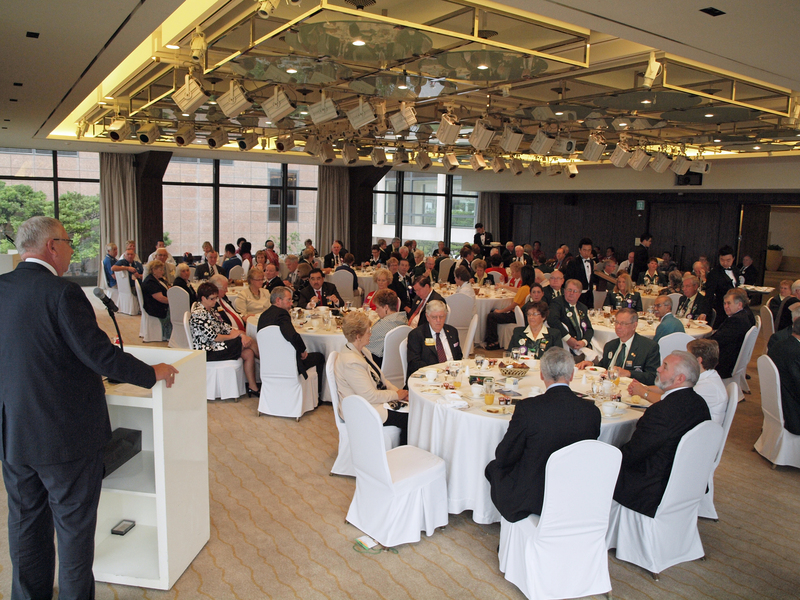 Lions International President Tam announced a number of service awards. Australia’s own Altona Lions Club from Victoria can be very pleased to have been one of three finalists in both the Best Hunter Relief Program and the Best Long Term Environmental Project Service Awards. Although not the ultimate winners, we congratulate them on reaching the finals in these international Awards. You can find details of the Service Award finalists here. Dr Margaret Chan, the Director-General of the World Health Organisation(WHO) gave an inspirational speech about the strong alignment between the achievements of Lions, and a number of key issues within the WHO radar. Early in her speech she acknowledged the foresight of our own Aussie Lions in supporting the work of Australian Prof. Ian Frazer AC to develop the Cervical Cancer vaccine. Three highlights of her talk, it was inspirational, it was brief, and she finished with her own rap about Lions. Love your work Dr Chan! Immediate Past President Sid Scruggs III presented the achievements of LCIF over the past year, a moving tale reflecting our ongoing work in the disasters in Haiti, Christchurch New Zealand and the aftermath of the Joplin tornado in Missouri. Providing immediate relief, recovery, re-housing; Lions does it all. PIP Sid mentioned that Lions was distinguished in Haiti as being one of the few not-for-profits that had delivered on all of its promises. A pat of the back for Lions around the world. PIP Sid Scruggs III is a great friend of Australia, and gave his farewell quoting an Aboriginal proverb about friendship. 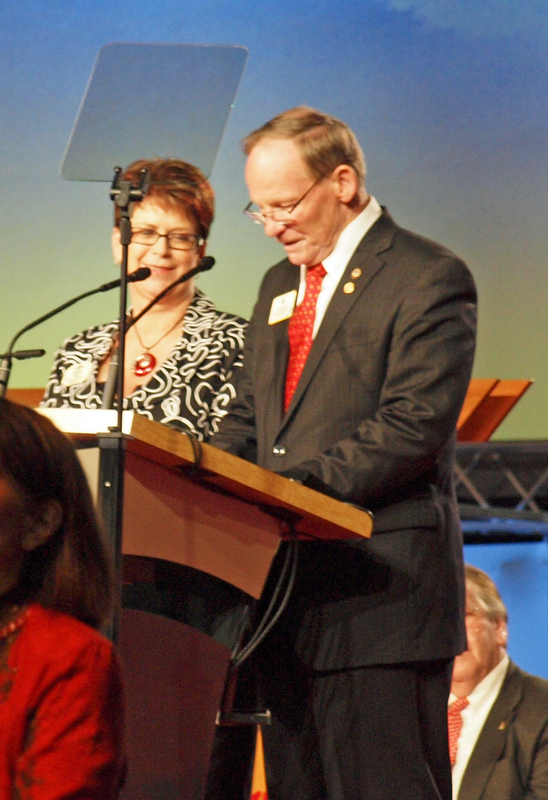 Of course, the announcements included the nomination of our own, Barry Palmer AM, for the position of First Vice President, that will be determined by vote, tomorrow. 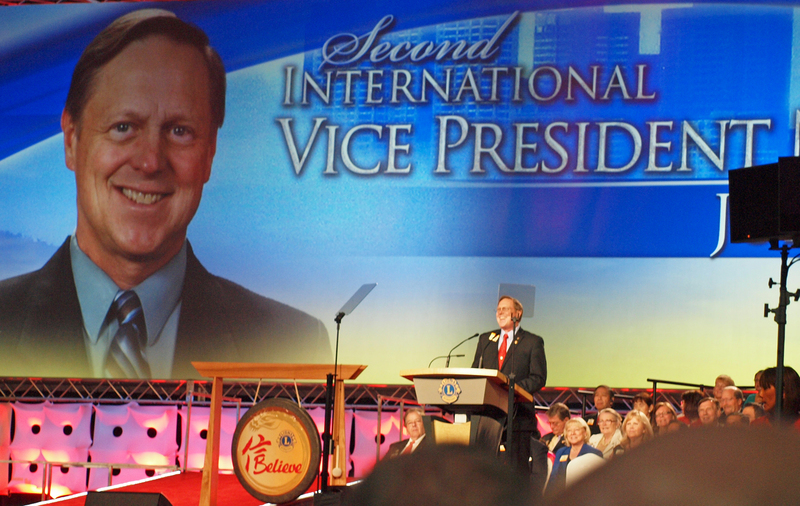 Finally we heard from the candidate for International 2nd Vice President PID Joe Preston from Arizona, USA. 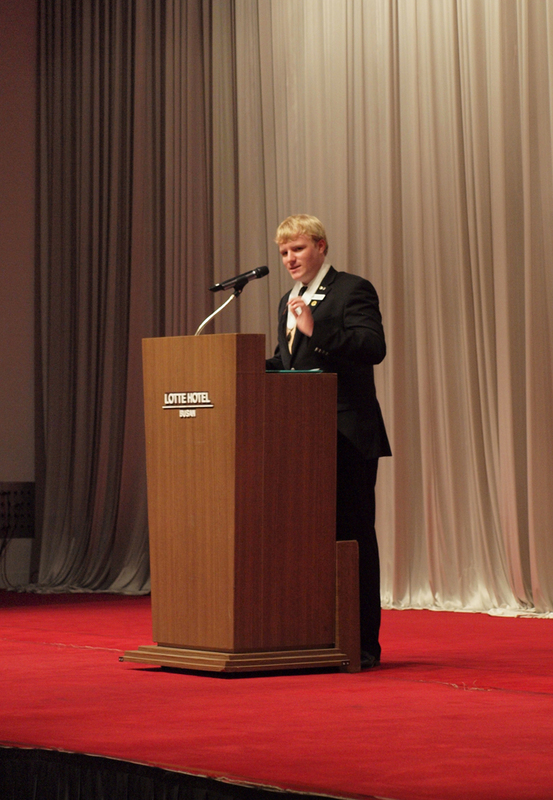 Joe spoke about his desire for the position, finishing his speech by breaking into a song of his own composition. For those who haven’t attended an International Convention, the next 15 minutes included the organised mayhem of “the demonstration” led by Lions from the candidates multiple district. 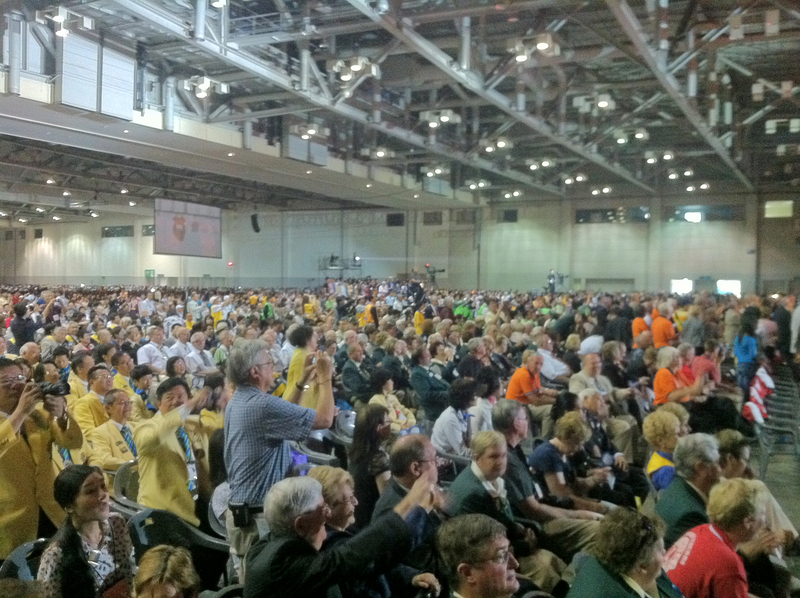 A great plenary today…and tomorrow the third plenary concludes the Convention. 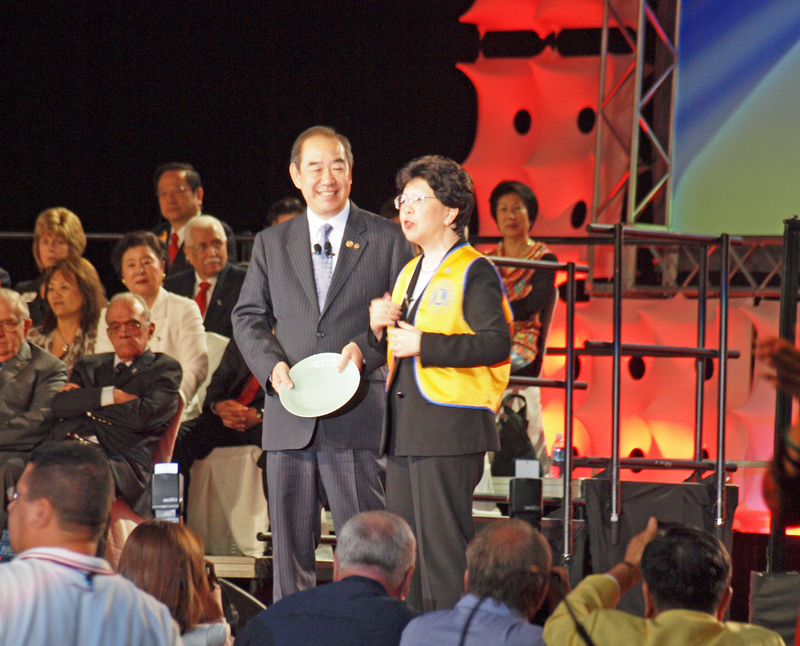 The Final Plenary saw the delegates farewell the popular outgoing Lions President, Dr Wing Kun-Tam, who returns to the executive as the Chairperson of the Lions Clubs International Foundation. The entertainment during the Plenary was provided by the extraordinarily talented China Disabled Persons’ Federation Performing Art Troupe, who with their founder, Deng Pufang, received Humanitarian Award for 2012. The delegates were introduced to the new President Wayne A Madden, who explained his theme for the year; “In a World of Service” . For details of the theme, follow this link. World of Service Theme. 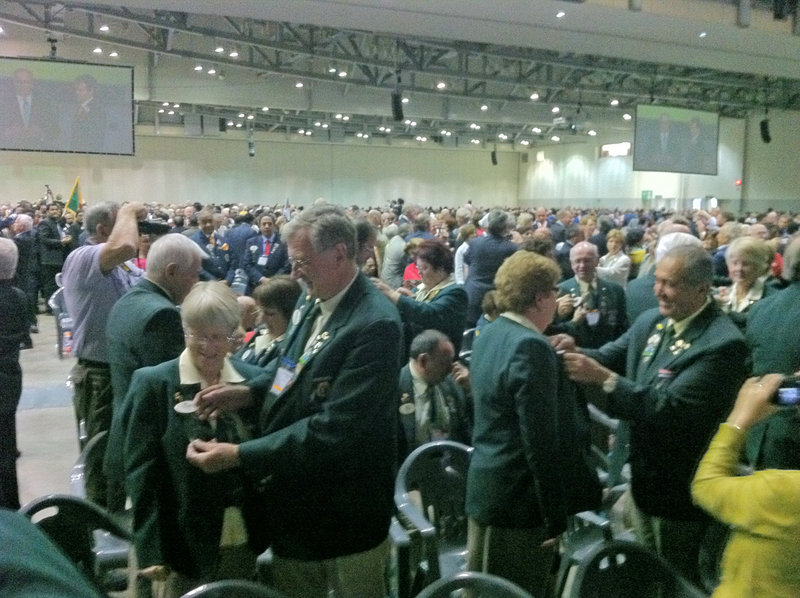 The conclusion of the Plenary, and the Convention, saw the induction of the new District Governors for the year, as they took their oath of office, and symbolically removed their DGE pennant from their uniform. Thanks to all delegates for their participation, and hopefully many Lions and considering the journey to Hamburg next year as part of their travel plans! thanks Rob for your excellent blog entries. They were the next best thing to being there.